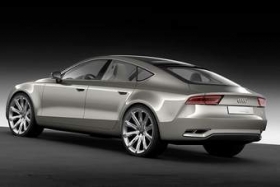 DETROIT -- Building on the success of its A3, Audi is upsizing the sportback bodystyle with a twist with the debut of the Sportback concept at the Detroit auto show. Following the lead of Mercedes-Benzs CLS and sister brand Volkswagen with the CC, the five-door Sportback concept takes on a coupe-like roofline. Hinting to a future design direction for upcoming Audi models is a new rendition of the companys signature single-frame grille with deleted vertical struts and lower overall height with flatter edges up top. Borrowing from the A5 are horizontal shoulders running the length of the body and rear-end styling also harkening to its true coupe sibling. The window strip along the four frameless doors and LED light units are flat helping to reinforce its sporty stance. The similarities to the A5 dont end there with the Sportback also sharing platforms with it and a number of components, which makes a production version (wearing the A7 name) viable if enough positive reaction is garnered by the concept. A large glass roof sits above the four-passenger interior covered almost entirely in leather. Breaking-up the sea of leather found on the headliner, dashboard, door panels, seats (with diamond-shaped stitch pattern) and trunk area is oak trim on the dashboard and center console. Continuing Audis diesel push, the concept is powered by a 3.0-liter turbocharged diesel V6 engine with its AdBlue system, helping the engine meet emissions in all 50 states and strict EU6 standards that dont go into effect until 2014. Special to the Sportbacks engine is the worlds first application of combustion chamber sensors that allow for more precise combustion regulation. An eight-speed automatic transmission and quattro all-wheel drive complete the drivetrain highlights. The suspension carried over from the A4/A5 features continuous damping control shock absorbers with selectable modes depending on driving and road conditions. Ceramic brakes at all four corners with six-piston calipers supply the stopping power. An electromechanical steering system is used that not only saves energy, but allows for a parking steering assist unit to be used for automated steering when parallel parking.